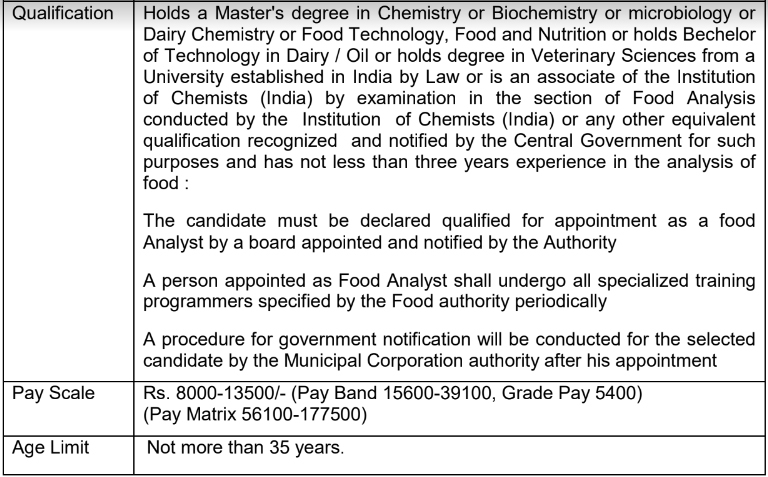 Surat Municipal Corporation is inviting applications from eligible applicants for the post Food Analyst. If you are searching for the jobs in Surat Municipal Corporation then apply for this job by following the applying procedure which is given below. Applicants who are eligible for Surat Municipal Corporation Recruitment can submit their applications through post on or before the last date. Applicants who are eligible to apply for Surat Municipal Corporation Recruitment can obtain the whole details via this web page which is prepared by the our team. Applicants who wish to Work in the Government Sector, they may apply for this jobs as soon as you can. For more info about Surat Municipal Corporation Recruitment like as post wise vacancy details, education qualification, how to apply, salary details, selection process, important dates, etc applicants need to read given below all information very carefully.